I learned at Bouchercon 2015 that Canada has identity-mongering guilty white liberals, just as the United States does. 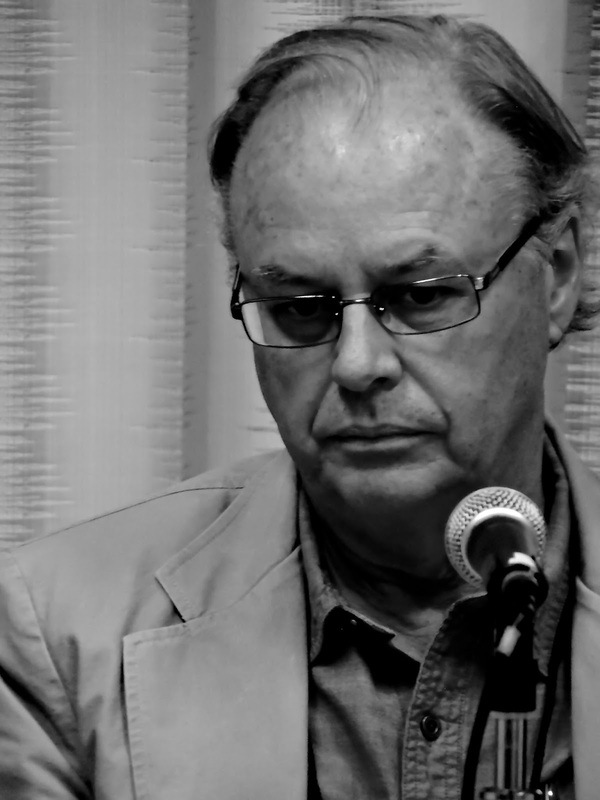 Saturday's panel on Canadian crime writing at Bouchercon 2015, included a complaint from Trevor Ferguson, a.k..a, John Farrow, about people who say that he, a white man, should not write about members of ethnic groups other than his own. He grew up in Montreal's Park Extension neighborhood, he said, in the only non-immigrant family on the street, so "Who else am I going to write about?" if not members of other cultures. And I neglected to include in Tuesday's post on Bouchercon bar conversations a number 7: Stuart Neville on crime fiction festivals and the possibility thereof in Northern Ireland. As my wife pointed out, that was a panel made up of five white men, too. I thought the panelists did a decent job answering that question, though I wish someone had asked them how many of the names they came up with were registered for Bouchercon and thus could, or should, have been on the panel. I always prefer that questions of this kind be specific: "Where are name, name, and name?" rather than "Where are the ----s?" I have it on exceedingly good authority that Bouchercon organizers took male-female balance into important account when making up the program and, if it's fair to ask why this panel was made up of five white men, is it equally fair to ask why one panel I moderated intruded three women and one man? I think Farrow is right. It reminds me a bit of Susan Straight, who is a blond blue eyed gal, but who not only had a black husband, but has biracial children, and if I have her bio right, mixed race in her ancestry as well. She too writes about black life, in her case, Riverside, California, but that's because it's not only where she lives, but what her ancestry dictates. I cannot understand the concept of telling a writer what he or she may or may not address as themes in their work. Having arrived late at the forum and finding all the (easy to reach) seats taken, I stood in the back of that room and watched as the men on the panel struggled (& even fumbled) over how to react to that question. (I am sympathetic, too. I have taught Canadian fiction for eight or nine years; the First Nations raise issues that are both central and disturbing for many Canadians.) Why were there so few minorities at the convention? No easy answer, of course, and one should resist being facile. Going to Raleigh costs money & time. At the other end of the rainbow, is there something about contemporary mystery writing that doesn't quite address minority concerns? I am sure there are a bazillion comments worth being heard. Seana: I suspect she has her critics, perhaps more from white people than from others. Fred, you're right. This post is a forum waiting to happen, so I will reply piecemeal, throughout the day and the weekend. As for the possibility that something about contemporary mystery writing addressing minority concerns, the phrasing of that sentence raising the ludicrous vision of a bunch of white male writers, and a few women, sitting around asking themselves, :How do we address minority concerns?" The question is a good one; my problem is with the people asking it, not with the question itself. Sarah Weinman's recent collections of (mostly) domestic suspense written by women from the middle of the twentieth century is a fine recent example of getting off one's keister and getting these women back into the discussion and into the bookshelves rather than sitting around and moaning and raising consciousness about "issues." She does something that is, rather than telling other people what they should not do. I think, too, of the recent Belfast Noir collection from Akashic Books. One of the editors admits freely that he and his colleague had trouble finding female contributors from Northern Ireland so had to cross the borders into the Republic. Akashic is known for demanding ethnic, genre, and sexual diversity in its collections, so you can believe that if it green-lighted publication nonetheless, it did not believe the editors were a couple of white males who shut their eyes to anyone but their own kind. Tales: I think that;s the point Farrow was making, One can understand the apprehension members of a given group might feel about being portrayed by writers from "outside," give the history of such depictions. But Farrow's "Who else am I going to write about?" is a good answer to that, I think. I should add that one of the writers on the panel said most such complaints (I think about his portrayal of people from Canada's First Nations, or aboriginal peoples) came not from members of those communities, but from white people. It's a nice coincidence that Marlon James, a black Jamaican, just won the Man-Booker prize for a crime novel this week. It sounds interesting, though Adrian McKinty, who has actually read it, says it's a bit of a slog over at his place. I didn't know James' book was a crime novel, but this reinforces my thinking that James is the best surname to have if one writes crime fiction. And it's probably no shock that a Booker Prize winner is not exactly a page-turner. Yes, it's about an attempted hit on Bob Marley--sounds a bit like Ellroy but maybe without his crazy energy. I still might give it a go. It sounds worth a look, though I never really got the whole Bob Marley thing. Perhaps the book would be illuminating iin that respect. This post and consequent comments remind me of the fact that I could never become an academic. It's worth remembering that when he wrote the poem "Bateau Ivre" Rimbaud had never seen the sea and that Jane Austen did not socialise daily in the elegant world which she depicted so well. Let me stir the pot (just out of old-fashioned mischievousness.) “Who decides that other people are in the minority, I ask myself...” Alexander McCall Smith is the British author of the Precious Ramotswe series, “Botswana's leading, and only, female private detective,” and the No.1 Ladies' Detective Agency novels have become worldwide bestsellers. Has a white entrepreneur co-opted African folklore to create an updated variation of Aunt Jemima, or mammy doll, and gotten hideous rich in the process? How would native African authors see it in the future? Would we ask the same question if Alexander McCall Smith had been a white South African rather than a white Scotsman? If he had been, like Michael Stanley, a partnership of two white South Africans of European descent, whose novels occasionally take up the ruthless and deadly mistreatment of an indigenous people by late-arriving interlopers? By this of course, I mean Bantu racism against the people we call Bushmen? Oh, it's not so bad if one spreads it out over a few days. Think of it as a buffet for the brain. A smorgasbord for the soul.